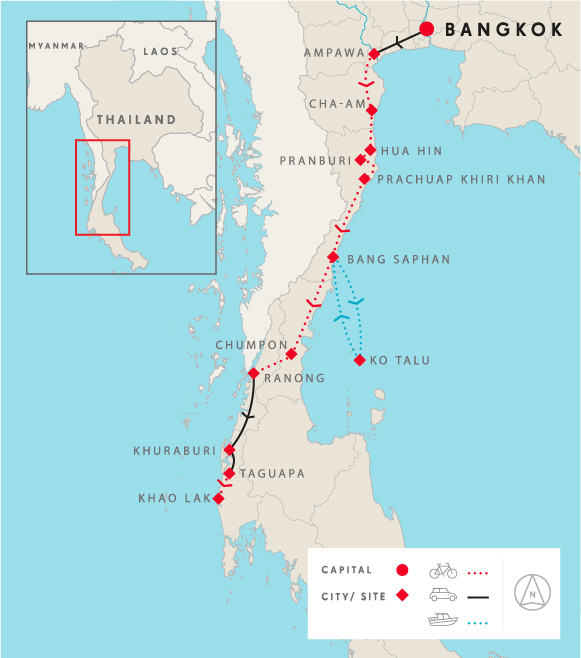 This exploration south by bicycle will provide a unique insight into the life and traditions of Thais and the beautiful southern coast. We cycle off the main roads as much as possible, so we can explore long stretches of beaches, the beautiful island of Koh Talu, and scenic areas around Koh Kho Khao and Khao Lak. We have a true Thai experience when we overnight at a traditional fishing community with a family. We meet in Bangkok and transfer to quiet roads to begin our tour with a glimpse at a traditional way of life along canals. From the floating market, we take our first boat trip and see wooden houses from water level. From here, we head south to explore the beautiful coastal provinces on the Gulf of Thailand and the Andaman Sea, visiting friendly fishing villages on our leisurely cycle. We ride through the stunning mountain scenery of Khao Sam Roi Yot National Park, take a speed boat to the tranquil island of Koh Talu where snorkeling in the crystal clear water is possible right from the beach, spend the evening with a fisherman to catch squid, and boat through a mangrove. We end our cycling on the coast of the Andaman Sea in Khao Lak, where the beaches are seemingly endless. The emphasis on this tour is Thailand’s history, culture, scenery and of course the beautiful coastline! We drive south to the Mae Klong Delta and start riding to Damnoen Nam Saduak Floating Market. Then boat through a maze of canals past many villages and plantations and visit quirky temples. Wake up early to participate in the Thai tradition of making an offering to Buddhist monks. After breakfast, we have a short drive to start our ride at a large reservoir and enjoy the views and cool breezes. This morning we cycle on local roads through seemingly endless fields of pineapple. Stop to visit a small cave and go for lunch at the Hua Hin Hills Vineyard. We overnight in a Hua Hin seaside resort and have time to enjoy the night market. We have a very flat ride to Sam Roi Yot (300 hundred peaks) National Park boasting numerous caves, pristine beaches and stunning limestone cliffs. After lunch, we can climb up to Phraya Nakhon Cave. After a short ride, we board a speed boat to our private island, Koh Talu. The afternoon is free to snorkel to see colourful corals and fish, to kayak around the island or to clamber up to the view point. We boat back to the mainland. We ride under the shade of palm trees and transfer to our next beach resort. Once the sun goes down we'll board a local fishing boat to see how squid are caught. We start with another coastal ride, but the terrain will start to undulate, making it a bit different from our earlier rides. We overnight at the port city of Ranong which is also on the border with Burma. We take a short morning ride to a local hot spring and transfer to a village accessible only by boat. Learn local traditions by spending time with a family before having a memorable meal. Go for a morning hike with a guide to learn about the village's conservation activities to protect the mangroves and to restore endangered orchids. We then transfer toTakuapa for a late afternoon cycle. After a short ride to visit the Tsunami Memorial at Ban Nam Khem, we head inland to the small waterfall of Sai Rung. Then it's a short cycle to our beachfront bungalows for our farewell dinner. The tour ends in Khao Lak. Day 1 - Bangkok - Ampawa Ride 35km. +140m / -141m. Everything is top quality: guides, vehicles used, bikes, hotels, food provided, attention to detail and safety. Cycling was great. Exactly how described in itinerary. Excellent leaders. An excellent combination of exercise, culture, trying local food and good companionship. Yo our guide, who did an excellent job, was always smiling and service-minded. We cycle 325 kilometres in 10 cycling days exploring beaches, waterfalls, jungles, and fishing villages, overnighting on beautiful islands. We enjoy some time off the bike, so we can take in boat rides, wildlife, and islands. The cycling is on a mixture of tarmac and dirt roads, mostly on flat terrain. We designed the route for those who wish to see the rural Thai countryside and the rich history of Thailand, all while enjoying an active holiday. We ride off the main roads as much as possible, so we can explore long stretches of beaches, the beautiful island of Ko Talu, and scenic areas around Koh Kho Khao and Khao Lak. We have a true Thai experience when we spend an afternoon with a traditional fishing community. Suitability: You can expect a fairly gentle ride each day with none of the distances being overly long. There are a few small hills and some dirt trails, but these can be tackled by anyone with even a moderate amount of fitness. The emphasis on this tour is Thailand’s history, culture, and scenery, all off the beaten track. Biking Conditions: This trip is mainly on tarmac roads with a few sections where we will have hard packed dirt trails – no off-road experience required. An air-conditioned support bus travels behind the group to support us, and participants can cycle as much or as little as they like and still enjoy the same views as the rest of the group. Starting from Bangkok, we drive south to the Mae Klong Delta area to start our ride at Damnoen Nam Saduak Floating Market, the biggest and most colourful in Thailand and a must-see for any visitor. From there, we embark on a long-tail boat cruise through a maze of canals cutting through local villages and various plantations. This eye-opening boat ride offers a glimpse into Thailand of old, where local people are going about their daily life with the canal as the focal point. Then, we start riding into coconut plantations and fruit orchards along quiet backroads. We visit interesting temples, such as the quirky Wat Bang Kung, held up by a huge banyan tree, and the exceptional carved panels of Wat Bang Kae Noi. At night, we relax in a comfortable wooden Thai house by the river. Wake up early to participate in the Thai tradition of making an offering to Buddhist monks. As we are on the river, the monks will come by in their boats. After a leisurely breakfast, we transfer for approx 1.5 hours to Kaeng Krachan National Park. Thailand’s largest national park, Kaeng Krachan is an excellent place for an adventurous day. We visit the park’s headquarters on the edge of a large reservoir and enjoy the views and cool breezes. We ride along the lake’s shoreline and across an impressive dam before heading inland along trails and quiet country roads. We stop often in this tranquil area to take in the wonderful views and give you time to take photos. There are some small hills but nothing too strenuous or taxing. The ride will end at our very comfortable, secluded, and beautiful resort beside the river, set in wonderfully landscaped grounds. We have time for a swim or massage before we enjoy a great dinner at the hotel. We ride directly from our resort on country roads through mango orchards, sugar cane fields, and palm plantations. We cross the Petchaburi River and ride 23 km to a reservoir. We take our first break and hop in the van to visit a temple with a small cave. We take the stairs for a short walk up to the Dao (star) Cave, named for some unique formations inside. We ride only 10 km more to our lunch stop at the Hua Hin Vineyard. From our table, we'll have a perfect view over the vineyard where the New Latitude grapes are grown - Colombard, Chenin Blanc, Muscat, Shiraz, Sangiovese, and Tempranillo. Wine is not included in our lunch, but there are tasting sets for those who want to try Thai wine. After lunch, we get back on the bikes and take a back road that alternates between dirt, gravel, and tarmac to Wat Huay Mongkol, where a famous monk is revered. Then we'll pack up the bikes to avoid traffic and drive 30 minutes to our centrally located hotel in the resort town of Hua Hin. Enjoy a stroll through the night market after dinner. We start the day with a short transfer to our start point just outside Hua Hin. Today's ride will be along the coast with picturesque fishing boats making excellent photo opportunities. We start our ride at a temple where we ready our bikes for a very flat ride past fishing villages, schools, temples, and many coconut plantations. Following a windy road that offers some shade, we soon find ourselves among shrimp farms. We weave through the town of Praknam Pran and see squid drying on racks at the fish market. We ride past Khao Kalok, a large rock that separates one bay from another, numerous resorts, and, if the wind is right, a kite surfer or two. After entering Sam Roi Yot (300 hundred peaks) National Park, known for numerous caves, beaches, and limestone cliffs. We ride to the base of Phraya Nakhon Cave, where we have lunch. For those enthusiastic enough, there's a climb up to the two caverns which are unique in that they are naturally illuminated due to a collapsed roof. 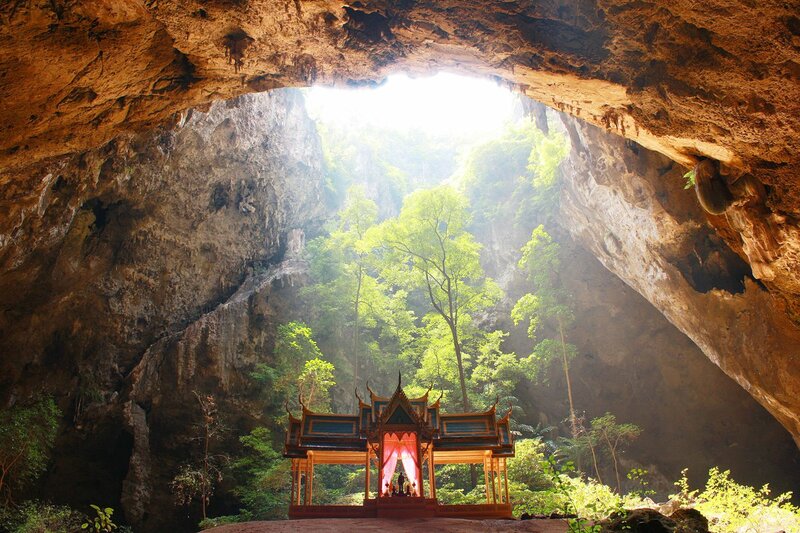 In 1890, King Rama V visited the cave and built a royal pavilion that became the symbol of Prachuap Khiri Khan province. We then hop in the van to miss a busy section of highway to our next seaside resort. This morning, we have the option for a short 20-km ride along the coast before a brief drive to the pier where we board a speed boat that will whisk us away to our own private island, Koh Talu. The afternoon is free to snorkel with the colourful coral and fish, to kayak around the island, or to clamber up to the view point. Dinner tonight is at our resort on the island. There is time to go for one more snorkel before we take leave of our is-land oasis and boat back to the mainland. Our bikes will be waiting and ready for us to ride. Our palm tree-lined route takes us past white sand beaches on one side and a backdrop of green lush hills on the other. Depending on the boat's arrival time, we'll ride for 30 km on a scenic road and then transfer to our next beach resort. Once the sun goes down, we'll board a local fishing boat (if the weather cooperates) to see how squid are caught by lights on 15-m beams extended over the water which attract the catch. We start today on the bikes with another coastal ride. However, the terrain will start to undulate, making it a bit different from our earlier rides. Once we have completed our distance, we'll take a lift in our support vehicle up to see a coffee plantation where the region's best Arabica coffee is grown, as well as orchards that produce longan, a small, sweet, and sour fruit grown widely in the south of Thailand. We then stop at Poonyaban Waterfall, where there’s time for a dip before we continue on to our overnight at the port city of Ranong, a Thai province that shares the border with Burma. After breakfast we hop on the bikes and head inland. A short ride takes us to a local hot spring. There are three natural spring pools, and the water temperature remains constant at about 65 C. Once we have relaxed our muscles, we transfer about 2 hours to our next Thai experience at a village where Muslim, Buddhist, and Moken live side by side. We'll immerse ourselves in learning local customs and traditions. We then meet our host family with whom we'll learn how to make authentic Thai snacks, and, of course, enjoy the results. After lunch, we bid our hosts goodbye and transfer to our resort. Wake up to the sounds of birds chirping at the resort surrounded by jungle. We transfer about one hour to the old city of Takuapa, which once was a flourishing trade port known by Indians and Arabs back in the 17th century. Tin used to be the major export that brought wealth to the city, and what remains are the merchant houses built in Chino-Portuguese style. We have a leisurely cycle through the town and then ride on to visit the beachside Tsunami Memorial at Ban Nam Khem and the big fishing boat that was carried an amazing 2 km inland by the surging waters. Smaller boats were also deposited nearby, particularly in a pond we’ll pass. We have an early arrival, so you can enjoy the beach as well as the pool and spa at our resort, built in typical Thai architecture style. We'll have dinner on the beach tonight. We cycle from the resort and head inland to take a quiet backroad through small villages and shady rubber plantations and cross rivers as we cycle to the small waterfall of Sai Rung. There’s a dipping pool at the base, perfect for cooling off before we have lunch. Then it’s a short cycle to our beachfront bungalows. We meet up for our farewell dinner and reminisce about all the Thai experiences we have had along the way. The tour ends in Khao Lak. However, we can assist you in extending your holiday at this beach resort or with transport to Phuket to catch a flight. Because some people can't imagine going on a trip without their own beloved bicycle, we do not provide them as part of this tour. However, you can hire bikes locally for the price listed in the tour pricing section. The bikes are Trek hybrid bikes with lightweight alloy frames, 24- to 27-speed gearing, v-brakes, and Shimano components and front suspension. If you bring your own bike, please make sure it is in good mechanical order.